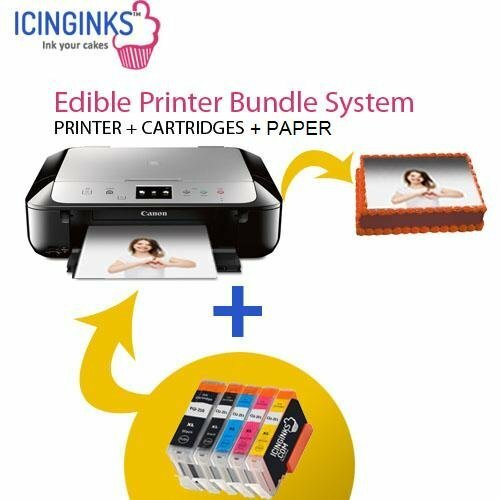 Yummy Edibles Latest Edible Printer bundle includes Wireless Canon Pixma TS5020/TS6020 All-in-one edible cake printer, 1 set of refillable edible cartridges, edible cleaning kit,50 wafer sheets that you need to start edible printing business whether it is a home-based or professional bakery. This edible printer works well with below edible papers : 1.) Frosting sheets 2.) Icing sheets 3.) Fondant paper 4.) Wafer paper 5.) Chocolate Transfer Sheets 6.) Pizza edible sheets. The printed edible sheets can be applied to cakes, chocolates, cupcakes , cookies , macarons , meringue, Pizzas and other food materials. Edible ink cartridges which we supply along with this printer are FDA compliant and are made in USA using high quality food edible materials under very strict food manufacturing conditions. At IcinginksTM we customize the Canon printers, edit some settings on the machine to make it compatible with edible printing which finally delivers better end results, colors and printing quality. Lifetime Edible Images Editing Service - You can email us what type of edible image editing you need. Works With Mac & Windows - Prints Max. up to 8.5" x 11.7", Comes with 5 Refillable Edible Ink Cartridges XL Size Completely Filled With Edible Ink & Can Be Refilled Again. Compatible With Frosting Sheets, Icing Sheets, Sugar Sheets, Wafer Sheets, Rice Paper, and Chocolate Transfer Sheets. If you have any questions about this product by Icinginks, contact us by completing and submitting the form below. If you are looking for a specif part number, please include it with your message.